Today’s industry aims to segment supply chain as ‘One-size-fits-all’ does not fulfil the desired objectives in terms of sales, profitability etc. Same product is sold at different price or service level or quality etc. A product may be targeted at specific customer or region or channel for higher price. So, when an order comes, system should differentiate its availability check based on these attributes of segmentation. There may be scenarios that if an order is created through Internet (online) , then that order will have different available to promise (ATP) quantity w.r.t sales orders created through other channels for the same product. There is no simple or easy solution for ATP in SAP ECC or APO GATP for this kind of product segmentation. Many a time, separate organization structure (Plant or storage location etc) is used to segregate the products so that the orders with non-internet sales channel do not steal the product kept for internet sales (or vice versa). I have an experience of working with a customer who did not prefer separate organization element like plant for product segmentation and a solution with APO’s PASS (Parameter dependent ATP Safety stock) functionality was prototyped (and subsequently implemented) with certain enhancements for product segmentation with sales channels. Now, SAP has provided the segmentation functionality with its Advanced ATP (AATP) in S/4HANA 1709 release. Let’s consider the same scenario with segmentation on sales channel – Internet and non-Internet sales as stated above. Below screen shot (of CO09 from S/4HANA 1709 release) shows the quantity of stock for product FG20 in 2 segments , INTC (Internet channel) : 25 pc & NONC (Non-internet channel) – 15 PC with a total quantity of 40PC of product FG20 in the same plant 1010. Now, a sales order with requirement segment for Internet sales (INTC) of order quantity 50pc is created and the below screen shot shows the confirmation only for 25PC though the total available quantity for the product FG20 in plant 1010 is 40PC. The solution for available to promise (ATP) of product segmentation is much simpler and flexible with Advanced ATP (AATP) of S/4HANA. The Article above mentioned is really very informative, A special thanks for posting to all of us. Can you Please detail where do we maintain the requirement segment. In situations like this, wouldn’t Product Allocation be an alternative given the fact that there is different sales channel defined for Internet Sales Vs non-internet channel. I am just trying to understand the key differentiation between PAL and Stock segmentation. Looking forward to your response. Yes, PAL is alternative approach for achieving segentation. But, you are also well aware that PAL with separate Sales channel or so needs additional system set up , master data and some level of maturity on planning. Many customers do not like to use separate sales channel , plant etc to segment the stocks. Now, we can achieve segmentation of stock without separate sales channel or so. Where in SPRO we setup segmentation? We are on 1709 FPS01 and under Logistics General -> Segmentation node there is practically no customization possible. 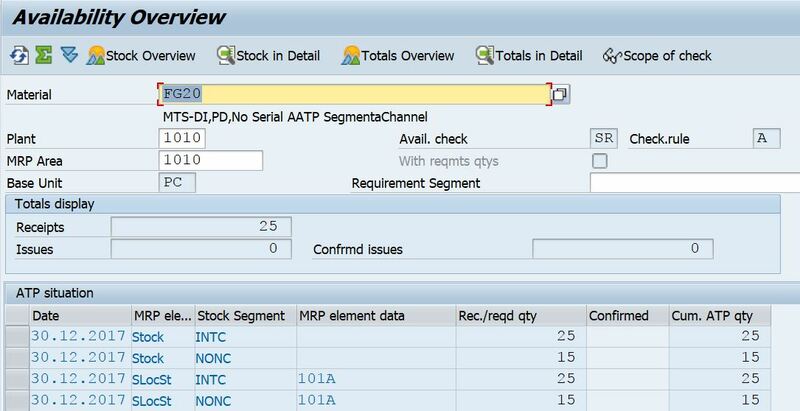 Can you please give some information what are all the pre settings are required to achieve this segmentation in S4 HANA AATP? Also is it possible to maintain several stock segments in a single position of inbound PO? For example, we ordered 100 pieces, 50 for internet channel and 50 for non-internet channel. Or is it mandatory to split position of PO in 2 in this case? Yes, it is feasible to maintain 2 segments in same PO. Thanks for this informative post. We started implementing S4Hana version 1809 in our organization, which is belongs to manufacturing industry. We are having one work center with different line of products and multiple profit center wise common cost centers. We are trying to break the different line of products into different segments and same expense are being booked through single cost center and through different line of products also currently. So in this scenario we plan to config multiple segment with single cost center. Is it possible? Sorry, I am not very sure whether this concept of segmentation can be used for multiple segments within a single cost center.